A question for the hive mind today (Tyranids or not). Does anyone have a (really) good use for resin cast-off bits and blocks from Forge World projects? What do people turn these things in to -- apart from rubble for scenic basing? Following on from yesterday's Primus, today I wanted to show my fully assembled Genestealer Patriarch. Again, this model is from the Deathwatch board game. Unlike the Primus, this one was a bit more complex to glue together, but not amazingly so. In line with the Primus, there is no option for poses or anything like that. The pose is fixed. The left leg comes cast directly on the the pipe that the patriarch is standing on, whilst the right leg is glued in to position directly at both the hips and the top of the pipe. Again the computer generation of this is incredible. One can hardly see the join between the right leg and the pipe (in my opinion). The other arms are then all glued in to place on to the main body -- the joins being rectangular nubs that go in to the appropriate holes. I like both the pose (hand on brain and pointed claw finger) plus the near-kneeling on top of the pipework. The vibe of the patriarch is a good one overall and I'm certainly looking forward to painting this monster up in the coming weeks! I caved in and bought a few Genestealer models from Deathwatch. One of the first that I got hold of was the Genestealer Primus. As might be expected from the game and previous GW games, the miniature is a "front and back" style miniature. i.e. There is a distinct front bit and back bit to glue together rather than what might otherwise be expected from larger boxed sets (i.e. distinct legs, torsos and arms that all need to be put together). I actually like the front-and-back style of moulding as it means less messing around in some regards. Equally, it also means an order of magnitude less pose-ability. And this is a bit of an issue for anyone who likes to tweak or try to instigate unique poses like I do. However, I am very pleased with this particular miniature. The new line of GW models that they've come out with recently is really top notch. Its very easy to tell that this miniature was computer designed compared to the older series of plastics and metals that GW put out many years ago. The sculpt itself is still nice and crisp -- hence no signs of ageing. In all, the model was very simple to put together and I'm very pleased with it! I have a patriarch from the same game to assemble yet, and then I'm thinking of getting the codex and seeing if I want to purchase anything further to be honest. I'm really liking what I'm seeing with the gene stealer codex though and I certainly will think about adding a small genestealer army to my collection. I've been meaning to finish off my series of Warhammer World pictures, but there's just so many of them to sort through! So today, a semi-random selection of Titans that are in the cabinets of Warhammer World. Enjoy! On the one hand, the Armies of Dark Compliance are a direct antithesis of the Shattered Legions Army Theme, as well as (arguably) loyalist Blackshields. They can represent any number of occurrences during the Horus Heresy. Perhaps it is an Alpha Legion force raised up to terrorise some important sub-sector. Or maybe its a sub-set of Mortarion's Death Guard on their conquest campaign under Horus' orders. Whatever it is: its about space marines herding mortals in to the mouth of war for the sake of the Warmaster. Fundamentally, this army theme means that you can take a cultist army (militia army) without needing to take allies. Hence its a great way to represent space marines plus their cult armies being forced forward by uncaring Astartes. The Warmaster's Due means that space marines gain a one pip bonus to cover saves when there's militia in the way. This is very fluffy and can make a difference to those space marines in the long run. Its not that strong turn to turn, but over 6 turns might be a solid bonus. The flip side of this is that the militia unit suffers d3 wounds for the privilege. Sure, its traitors only here. Since the loyalists clearly are the only ones that care about mortals (not entirely true!). However, they cannot use a rite of war associated with any legion. This is a fair counter balance realistically, and its fluffy. And of course: a legion praetor or consul needs to be the warlord. Plus is has to have more mortals than Astartes. And no discipline master cadres either. The Disposable rule is optional and needs to be declared if being used. It can mean denial of victory points to the enemy under certain circumstances. However, the counterbalance of not even being able to deny objectives is harsh for the other elements of the mortal army. Whether the Warmaster's Due is actually worth it or not is something I'm uncertain on. The extra wounds caused to militia units will rapidly wipe them out, but it could mean a few marines survive plasma shots where they would not otherwise thanks to low AP. In the long run, those militia were probably going to die anyway. But perhaps in the long run, it could save a valuable space marine or two over the course of a game. And that could be critical. Disposable is a bit hit and miss and depends on the enemy, and the mission. Overall, this is a great way to make a themed army without having to take official allies. This allows a third faction (mechanicum perhaps?) to be readily included. Otherwise, its not really as appealing as the shattered legions in the slightest to me. A shattered legions force is one that is drawn from two or more distinct legions in the aftermath of various events of the Horus Heresy. The most cited example of a shattered legion force is that of the Salamanders, Iron Hands and Raven Guard following the Isstvan V campaign and represents the survivors banding together to exact revenge on the traitors. Other less obvious ones might be Alpha Legion working with almost any other loyalist element to bring about victory for the loyalists; certain elements of the White Scars getting together with other traitors following the internal schism in the White Scars, World Eaters and Word Bearers left behind after the Shadow Crusade, Lutherian Dark Angels plus others, and the list goes on and on. The whole is greater than the sum. Literally, this rule means everyone in the army plays nice -- they're sworn brothers. So long as the warlord lives. Beyond this (which, admittedly is just a nice way of having a coherent force), they can have access to legion specific rites of war that will apply to everyone in this army, and have their rules modified. For example, the Night Lords will no longer suffer from the Seeds of Dissent special rule, but can apply the night vision rule to all units in the entire army which is nice. Its the best of all worlds really! The most obvious thing to state about Shattered Legions is that playing them requires the agreement of both players. This makes me a bit sad, but I can see why the designers wanted it that way since there's got to be some broken combinations in there! (or at minimum: very powerful ones! I'm looking at the Death Guard for that personally!). Beyond this, there is a price of redemption: units can never be denial units. Oh well. Better go for the alpha strike then and take as many heads as possible! There are two specific listed rites of war for shattered legions: After Isstvan (for the RG, IH and Salamanders) and the Hunter-Killer mission (for the EC charged with tracking down survivors). The former is reasonably nice (and fluffy), but the latter leaves a bit to be desired as there's little positives going for it. The Shattered Legions forces are a great way to expand a collection. They can be used as either traitor or loyalist, and feature any unit from any legion (plus generic ones). There's little not to like here and I could certainly be tempted to go down that route for some fun games. I'd just advise avoiding having Death Guard as the warlord … because it can be a bit over-powering! Unless you're facing eldar. In which case: go right ahead. 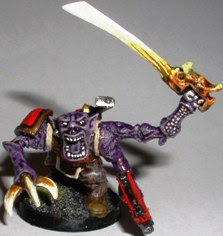 There has certainly been a lot of evolution in genestealer models over the years. 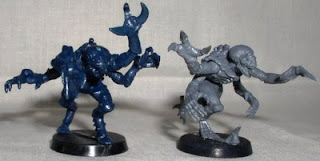 The picture below shows the very original plastic genestealer from Space Hulk days of yore compared to a more "modern" model (well -- from the 2000's at any rate). I've noted this before on different posts, but ignoring the different plastic technologies, it is readily clear that the newer version is much more dynamic and can be posed in a variety of ways. The sculpts are also subtly different: the new version's exoskeleton appears stronger with fewer weak-spots compared to the older counterpart that has exposed flesh in the centre of the back. This has been replaced with a more boned exoskeleton along the back that looks radically different. Clearly the hive mind has been at work over the years. The new model's rending claws are also better looking to me, but the more human, rear pair of hands are broadly similar. I might go as far as to say that the older genestealer's human-like hands are preferable given their dynamic look; the newer one can appear like it is about to slip on a pair of mitten gloves before venturing out in to the dank, chilly service tunnels of the Space Hulk. Regardless, I still have a few very old genestealers knocking about the collection. I think I might even have a lead patriarch in the mix somewhere as well. With the new codex about to be released, I might well dust off some of my very old models and see if I can re-purpose a few of them for a genestealer mini-cult. The Knights-Errant are a diverse bunch, selected from promising and "inquisitive"individuals from across all the possible legions. More than this though, they are very loyal to the Emperor, the Throne World, and all that the Imperium stands for. They are the elites of the legions who are also the cast-offs, regardless of the loyalties of their primarchs or not (and Forge World, if you happen to read this, please let Omegon be Janus! Pretty Please?!). Much like the legion praetor, these characters can be very customisable depending on what battlefield role that their controlling player desires to go in. I think there are multiple (and good!) ways to build them. But all of them come with the standard Oaths of the Moment that should be thought about, the paragon bolter as well as the falsehood for pin-point accurate teleportation needs. The latter makes a number of possible Oaths of the Moment rather attractive. In particular, the Crusader objective is very easily attained by such a Knight-Errant. Others are tougher. In their favour, that also sport 2+ armour coupled with an Iron Halo and a master crafted power weapon of their choice. Power Axes are probably going to be favoured here, but I can see cases for others potentially as well depending on the role that one sees for these characters. The temptation with a customisable Knight-Errant character is to spend too many points making them in to some kind of uber unit. This needs to be avoided as an army is categorically not an army of one (despite novels of the same name!!!). The question is then: what battlefield role should your character have. To try to answer the above answer, here is a few suggestions to consider and muse over. Knight-Errant; Librarian, Level 2 Mastery (175 points). This is a way to work in a psyker in to your army. Presumably, it will already have a couple of them in it already though? Frankly, at this points level, I'd be thinking of Tylos Rubio instead who is tremendous value by comparison! (maybe this will be FAQ'ed?). Knight-Errant; Jump Pack, Power Fist, Melta Bombs (145 points). Teleport in. Move around fast with the jump pack. Hit people in challenges with a power fist. Simple, but effective. Note the points cost -- its very reasonable for its purpose as well and can accommodate multiple Oaths. Take a Narthecium to taste. Knight-Errant; Servo Arm (135 points). Cheap enough to be a viable way to have a "repair" character in an army that needs to keep plenty of tanks at their peak performance. Knight-Errant; Nuncio-Vox, Sniper Rifle (125 points). With precision shot, hopefully this Knight can take out key figures in an open (i.e. not inside a tank) blob of troops? Knight-Errant; Narthecium, melta bombs, lightning claw, combi-melta (140 points). Place in a land raider with others and get the charge in? Not much point in the falsehood here though. Knight-Errant; Narthecium, jump pack, melta bombs, power fist, combi-melta, plasma pistol, Librarian, Level 2 Mastery (215 points). A near-ultimate build that can take on almost any role. Don't take it though: use something more specialised instead as this one is too general -- its a little bit too much of everything! Seriously? A genestealer cult codex? You know, I would not quite have believed it unless it was Games Workshop themselves announcing it. But: it was Games Workshop themselves! Horrah! I'm stoked! As my very ultra long term readers might know, I harbour a love for the genestealer cult army, having had a range of figures from my earliest days in the hobby. I guess I got hooked on Space Hulk, that later turned in to the Deathwing expansion that included all the hybrid models. And I still really love them. Even if they don't come with a cult limo, I'm still very likely to purchase the new codex to be honest! 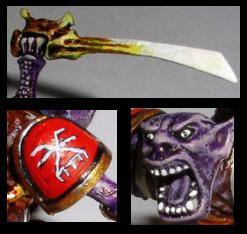 And to demonstrate just how far I travelled down the genestealer cult road ... here's a little conversion that I created many years ago -- its of a genestealer-ork hybrid model! I'm still fond of this idea personally, but can certainly see that its not the most common kind of xenos that one expects! (Yet it certainly was in the earlier publications; or at least hinted at within them that such hybrids could be created; along with Khorne worshipping orks!). Rubio was the first to be recruited to the Knights-Errant by Garro in his quest to assemble his team of misfit, yet unquestionably loyalist cousins from across all of the legions. It was during the Betrayal at Calth that he finally agreed to join up, having been forced to use his psychic powers to save his brother Ultramarines against the edict of Nikaea. Ironically enough, Guilliman had just concluded that breaking the edict was necessary to fight the warp space aliens at the same time. But too late for Rubio. He was shunned. And left with little option but to join Garro. I really like Rubio in the sense that he is a psyker that can be teleported with perfect precision on to the battlefield to cause all sorts of chaos where he is needed thanks to the falsehood. But to be fair, I like this about all the Knights-Errant to be honest! He's a level 2 psyker, so he is not exactly earth-shattering like we would expect of (say) Ahriman of the Thousand Sons (let alone Magnus the Red or Lorgar Transfigured). But he does get a very attractive re-roll of failed psychic tests for the divination discipline. Hence even though he has access to telekinesis, he will most likely be generating all his powers from divination. Using his force sword, he can boost his strength from left over warp charges which is also very nice. His equipment is otherwise standard fare for the Knights-Errant. Overall, he is nothing too special to be honest. Despite this, he has a good role to play in either being a strong distraction when he teleports in to play deep in the enemy deployment zone, or by supporting other units on the field through his divination discipline focus. A solid choice if you want an extra psyker in your army and you don't care too much about the Edict for some reason (remember he's loyalist and so must your army be!). What does mark him out is how relatively cheap he is in comparison to other psykers and librarians. As such, he is a bit of a bargain in literal points cost terms for a level 2 psyker, but that's about it. I would be looking at most Oaths of the Moment except for King Slayer … and I'd be tempted to look twice at Headsman unless he is absolutely going to get in to base to base contact and use that force sword with lots of spare warp charges to power up. Much has already been spoken of Garro. The former Battle-Captain of the Death Guard. The Captain of the Eisenstein. The person who brought word of Isstvan III to the Imperium. The one who bent his knee of Malcador and became the first of the Knights-Errant. The one who would gather the other unique Knights to his banner. Garro is fundamentally equipped to be a close combat challenger. His sword, Libertas, is strong with +1 S, but the AP=3 is poor despite the rending ability. The special rule Edge of Truth on Libertas means that he will frequently win combats though with a bonus to the resolution. His invulnerable save is worth mentioning. Usually it is 4+, but in a challenge, it increases to 3+ which is about as amazing as it gets anywhere in 30k. A little bit like Loken, who Garro would later recruit!, he can come back from his last wound thanks to his nascent faith in the Emperor on the basis of an Ld test. All taken, these rules means he is good in close combat and challenges (but not superlatively so), and a reasonable survivor (despite lacking the Death Guard astartes rules or any toughness bonus). It is also worth mentioning very briefly his falsehood (nice deep striking!) and his assault 3 bolter which is even better thanks to rending. Overall, Garro is somewhat bland. He's not going to be capable of taking on some of the bigger names in the Horus Heresy. But he will hang around a long time thanks to his faith. I'd be tempted to take Garro with almost any of the Oaths of the Moment rules. He is certainly capable (just) of succeeding in Headsman, and it would be very fluffy to try for the King Slayer option as well. The others are all perfectly viable as well. He will do well in most games, but he's either going to be used as a solo-distraction, or as someone to embed alongside the main force. The Knights-Errant are a unique force in the Horus Heresy; assembled by Malcador the Sigillite and assigned only to the most critical battles as their loss would be huge for the Imperium at large. As such, their inclusion in any battle will dramatically change the rules for victory. A Knights-Errant must select from one of a short list of Oaths. Some are good, some are easy to obtain, and others as tough as anything. There's a few catches. Firstly, the selection must be done in secret and a note made. Only at the end of the game is this note revealed when tallying up victory points. However, if the Oath is not achieved then the side fielding the Knights-Errant may not win at all. They can only draw at best! Hence, there's an explicit issue with fielding a Knights-Errant -- choose wisely! Crusader is the easiest to achieve and has the smallest points value -- being in the opposition's deployment zone will be rather easy for the Knights-Errant given their use of the Falsehood teleportation system if desired. This should be the default choice for the less adventurous or those just starting out with Knights-Errant. Protector is slightly tougher: a given other independent character must survive. Now, this is an entertaining option as the temptation will be to put the Knights-Errant inside the same unit as the selected character and take the wounds for them. Alternatively, sequestering them in a land raider and avoiding combat is another nice way to go about it. This could be a very easy Oath to fulfil, or could be a nightmare. It just all depends on the opposition really. Hand of the Sigillite is a nice option for those playing objective games. Having control of one objective should be straight forward if played well. Having that objective in the enemy zone is tougher but not impossible given deep striking accuracy and a slower moving enemy. Select this one carefully. It could be easy, or it could prove impossible if facing off against a fast moving army containing many bikes or assault squads. Headsman is tricky. Slaying the enemy warlord in a challenge is tough. Not only does it require the meeting of your Knights-Errant with the enemy warlord on the tabletop, but a victory as well. Now, in a challenge, the Knights-Errant are usually going to do well, but that obviously depends on which one you are fielding and how the enemy warlord is kitted out. But if the enemy warlord has alternative plans, then this could be a huge risk and gamble. I'd only take it if I knew I could get in to a challenge with an opponent's warlord. And that would usually be done with my friends by jovially winding them up to face such a challenge. But they're smarter than that and would see the ruse! King Slayer is the hardest of the lot in some ways. Slaying a Primarch is a big ask under any circumstances. And if the opponent is fielding a Primarch, then you might be as well. This could well lead to a stale mate. On the plus side, the Knights-Errant doesn't have to do this personally like the above Headsman entry. The enemy Primarch just has to die. I can't see Horus going down easily to be honest. And even the weakest of the traitor Primarchs, Alpharius (or Lorgar, depending on whether he's ascended or not), are a tough ask to deal with and can survive many things in a 6 turn game. Beware of this one. Take it as a fluffy choice, and the right thing to do! is something that other people are possibly considering? 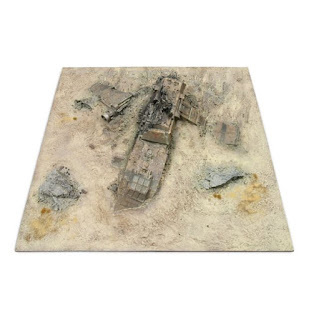 I haven't seen it suggested yet, but I think it has mileage in terms of a scenic setting that looks like either (a) pilot error; or more plausibly (b) a craft that was shot down just before landing (perhaps with a Primus Redoubt being the cause?). I think this has a lot of narrative possibilities myself! I'm just a bit put off by the sheer cost of this idea at the moment, that's all! I have been playing a lot of "No Man's Sky" lately on my rig. Its a new game released only last month to a barrage of criticism and acclaim. In very broad terms, it is a survival and exploration game similar in some respects to Elite / Elite: Dangerous, but with not only space trading and combat, but also plentiful land exploration. Indeed, there are over 18 quintillion planets in the game -- all procedurally generated. Most of the criticism of the game originates in what was suggested might happen by the developers (Hello Games) versus what was released. Indeed, there are features missing when one makes that comparison, but given its a small indie team who were almost wiped out by a flood in their office, I'm amazed it went ahead at all. For me personally, I'm loving the game! Can't wait to see what the devs might release for it next to be honest. Anyhow. I was happily wandering along on my own merry way and found this. Does this remind my readers of anything in particular? Heck, even within the game its called a drop pod. To me it looked very much like a Dreadnought Drop Pod from 40k/30k! Inside it was an upgrade for my exosuit, which was nice to have (it gave me a bonus slot for carrying more stuff -- which was incredibly useful!). 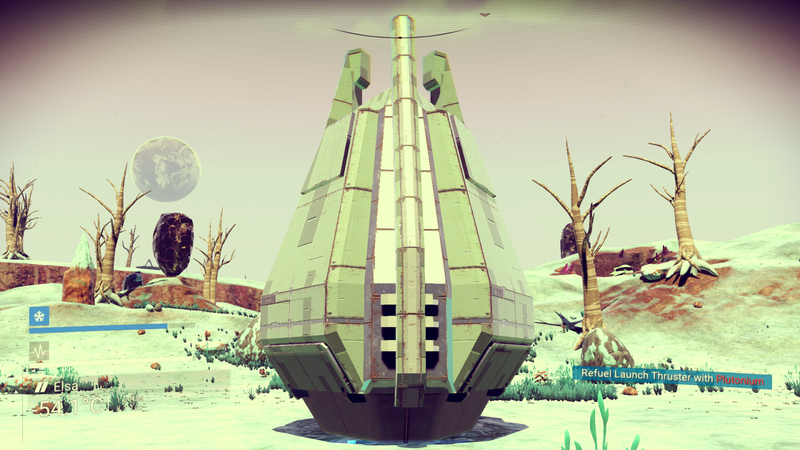 I will be looking out for more of these in the game! And if you see any planets discovered by "jabberjabber", then gimme a shout -- you know who to blame! Thank you for your submission to Black Library, and for your patience so far in waiting for a response, it is very much appreciated. This year we received many hundreds of submissions, and getting to the second stage of the assessment was a great achievement. Unfortunately, this time we have decided that we will not be taking your pitch forward. We appreciate that you may want feedback, however due to the volume of applications we have received providing feedback to everyone is not possible. Once again, we thank you for your submission and patience, and wish you all the best in your future writing endeavours. The Black Library Author Team"
I will therefore take some solace from this. I think I certainly did well to reach the stage that I did, and I will re-focus for the next round whenever it occurs. Logically: just because you're rejected once doesn't mean you're doing badly. Heck, I might well have been in the proverbial noise, or just a very close runner up, given the time scales involved. Being downselected to this stage means I'm at least doing some things right! 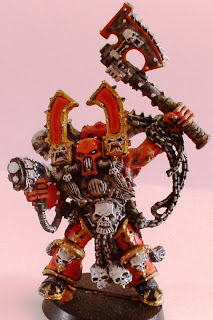 Kharn the Betrayer has been getting a bit of lime light of late thanks to the imminent release of his new rules and the formations from Traitor's Hate. I can't wait! But today, I wanted to make a quick note of one of my favourite aspects of the new rules that have been making the rounds on the internet: namely the Red Rain that the Maelstrom of Gore formation is able to invoke once per game. The Red Rain can truly be a game changer in my opinion, and it takes Khorne Berzerkers from being a bit "okay" to being potentially amazing. Potentially. Take transports with all of the Berzerker units (with Kharn being inside one of these said units) and get them in to position. 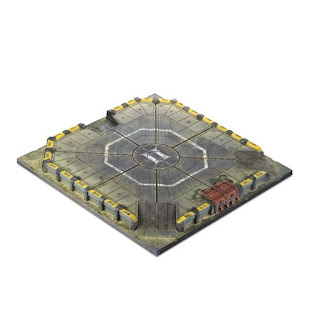 Unload (preferably from a land raider assault ramp) and get stuck in. The next turn, activate the Red Rain to gain an additional round of combat in the movement phase where the enemy cannot strike back and take advantage of it! I would probably want land raiders all around. And arguably the best way of doing this would be to utilise another of the formations in the Traitor's Hate book -- Fist of the Gods! As for the other formations, I really like the look of the core Chaos Warband. Sure, it doesn't give a lot, but its very thematic and would fit right in with my lust for 30k right at the moment. The helforged war pack is also very nice. I could well imagine having half a dozen dreadnoughts (ahem: helbrutes) in there just to test out an enemy. I also really like the cult of destruction. Getting twice the number of shots from obliterators could just about break the game in some respects. This is amazing and not to be under-rated. I would willingly take a warp smith per obliterator unit to make this happen. Overall, I'm excited about Traitor's Hate! Its the first time in a while I've felt positive about chaos space marine developments (ignoring the Khorne Daemonkin which was just too mono-god for my tastes). In short, the Marauder Squad is the Blackshield equivalent of a tactical squad, veteran squad, or assault squad (depending on your point of view). It is a very variable and customisable squad, depending on the nature of the force that is desired to be built. For me, the degree of customisation is almost unsurpassed in the pure legions army list. With all the usual array of legion weaponry available, they also have thinks like xenos death locks available and the pariah armoury available. They can take chain axes as their basic close combat weapon if desired as well (and why wouldn't you when the alternative is a mere chain sword or close combat blade?). Plus a lascarbine or auto gun for free as well. The extra members that can be added are a relatively cheap cost, although the unit base cost is somewhat steep. The points cost, as mentioned above, is pricey, but gets better with extra bodies. There is also a temptation to do heaps of upgrades here. I think this would be a mistake. A well-thought through set of upgrades with a specific battlefield role would be much better. Here are a set of builds to get folks thinking about the possibilities. 5 Marauders, 1 multi-melta, Chieftain with power fist, melta bombs, combi-melta (175 points). A bit of a melta suicide unit -- perhaps to take advantage of a free deep strike. Its very expensive though and other units might plausibly do it better. 20 Marauders, each with 2 bolt pistols, pariah power armour, 4 power weapons, Chieftain with power fist and melta bombs (405 points). This is a very big unit that will die rapidly to massed auto cannon shots and the like. However, the ability to run and snap shot is great -- particularly with twin bolt pistols each. Run alongside a rad grenade armed HQ choice, and it looks better. 10 Marauders, each with lascutters apart from 2 with melta guns, Chieftain with thunder hammer and melta bombs (320 points). This is one to ride inside a land raider to victory. Drop one member to include an appropriate HQ and select an appropriate Wrought by War rule. In the Pale Star, the Nemean Reaver was supposed to have an association with the Dark Angels legion before turning in to a Blackshields Outlander. Personally, I think he is a remnant of Legio XI (see here for evidence for this pet theory!). He later became an agent of Malcador and fought on Terra. He is presently a Blackshield marine, but can be selected to be an agent of Malcador for extra points. I want to highlight here the Reaver's armour. It is alleged that it pre-dates the Imperium in the background. With a 2+ save, the most notable facet of the armour is that it possesses Eternal Warrior. This is incredible in the 30k arena to be honest. With T=5, and a bunch of special rules (fearless, enemies get -1 WS in challenges thanks to his Calibanite Flammbard sword), he really is a high ranking figure that can do okay toe-to-toe with a primarch. He'll lose, but he'll at least survive long enough to give them a little tar pit moment. With fear himself, he might even rout normal space marines off the field away from him too. And that's even before we mention a good invulnerable save as well. More than this, he functions as a mild force multiplier thanks to his warlord trait giving his Blackshield brothers a bonus to determining the outcome to an assault in a small 12 inch bubble. This is again, a really big deal and can turn the tide of a battle. His Agent of Malcador stat line sees him replace his Blackshield rules and warlord trait with a bunch of other rules including preferred enemy (traitors) as he takes up the mantle of a Knight-Errant. This upgrade is again very strong and enhances his close combat ability very nicely. He needs to play to his strengths (front line leading, and close combat) to be maximised. But he is survivable if mistakes are made. I'd personally use him as part of a bigger blob of blackshields and embed him in there. Well worth the points in my opinion. Surrounded by a strong contingent of loyalist outlanders, he's going to do very well. As a Knight Errant, he's also very worth while considering and a viable option. I've nothing too bad to say about him: he is what he is and he does it rather well! There may well be no Wolves on Fenris, but my daughter has been having a go at them regardless. Following on from the last round (what seems a long time ago due to the Summer Holidays), the campaign map now looks like this. I think the map says it all really! The Eldar player is undefeated in the entire campaign so far, with the rest of us having won at least one game each. As for my Alpha Legion forces, we're now split between tiles on diametrically opposite sides of the planet. The Space Wolves are similarly divided. The Chaos Space marines meanwhile at least have a pair of contiguous tiles, including one (tougher to conquer) mountain tile left. Since I lost (against the Eldar) last round, I get to challenge first in the next round. I think I might try to take on the Chaos Space Marines. I at least have one extra manufactorum (meaning extra points in the coming battle) compared to him, and might have a slight advantage. I'm not sure what (collectively) we can do about the expansionist Eldar though. Its simply a very tough codex to beat down for all of us it seems!